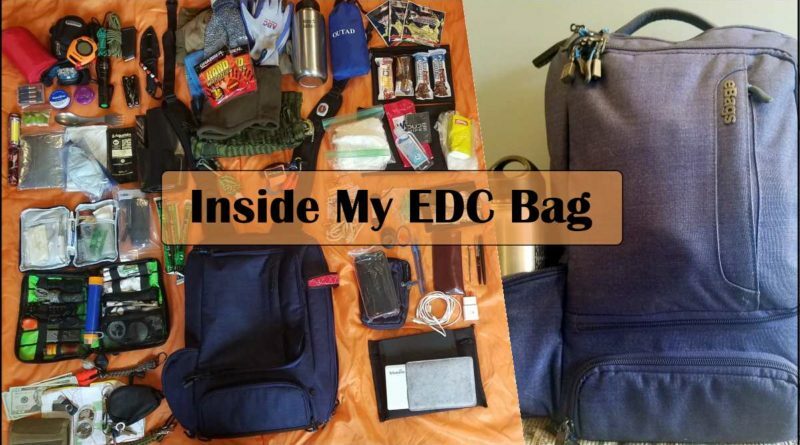 In this post, I’m going to dump my EDC Bag and show you what I carry in my pack every day. 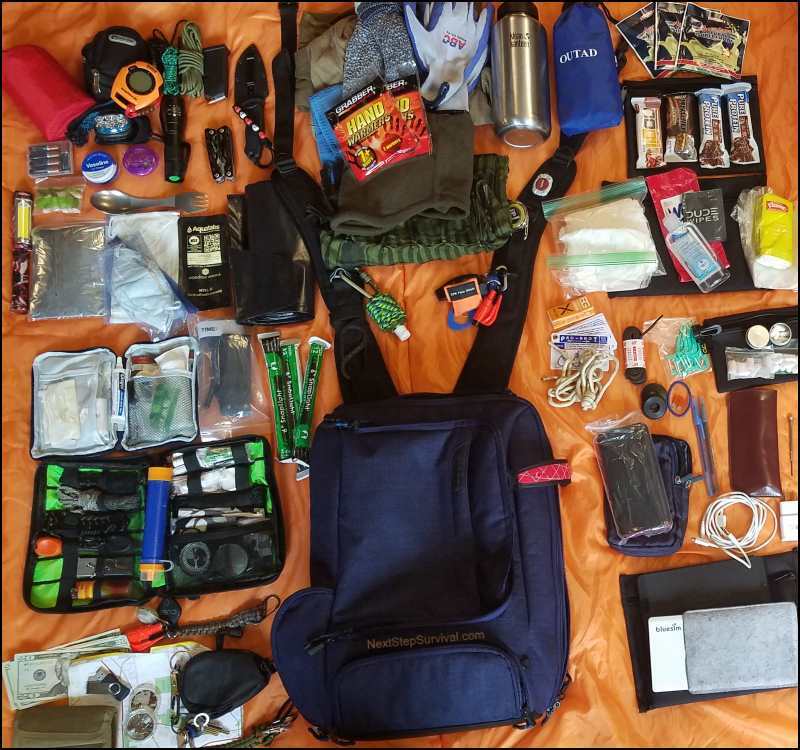 This is a “Gray Man” (or woman) approach to an EDC pack. An EDC Bag is an everyday carry bag or pack. It’s the gear I carry everywhere I go that won’t fit on my person. For example, my EDC handgun is a Glock 26 right now. You won’t see that Glock in my EDC Bag because I’m carrying that concealed on me in my holster. Everyday carry is things I want access to, no matter where I go. To feel as prepared as I can, that requires more room than just my pockets. Some of the everyday carry is survival gear. A lot of it is just things that help me get through a typical day in Brian’s world. My EDC bag goes with me everywhere – every day. Some of the “survival gear” is there to get me home in an emergency. In that sense, my EDC Bag could be considered a get home bag. With on major exception – distance. 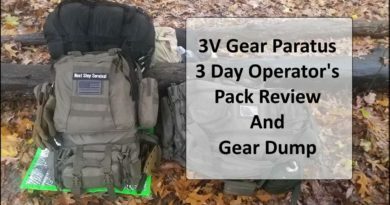 This pack is a local “Get-Home” bag, up to about 20 miles away from home. I generally don’t travel more than 12 miles away from home. Anything further than 20 miles away and I take a larger 72-hour pack, which is my official get-home bag. That pack is much more extensive an focuses more on survival and less on everyday life and comfort. Our daily requirements change often so our EDC has to be updated every now and then. For example, last year I wrote a post and recorded a video on my EDC Bag back then. That bag was a small range bag. Then I went on a Maxpedition gear craze and upgraded my EDC Bag to a Maxpedition Mongo Versipack. I don’t even want to think about the money I put into this bag. Every kind of pouch and accessory you can imagine. 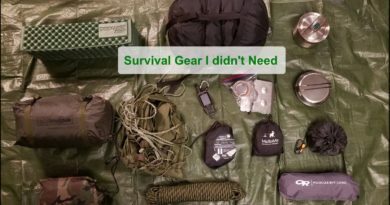 I almost put it in last week’s post, Survival Gear I Didn’t Need And Shouldn’t Have Bought but I did, and still do, use the bag. It was just more than I needed to spend. Today the Maxpedition Mongo sling pack in my range bag. 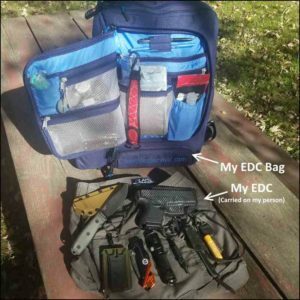 I loved the Maxpedition set-up I had but I needed to retire it, as an EDC bag, anyway. More on that in a second. Today I’m using an eBags Professional Slim Laptop Backpack. Everything you see in the featured photo fits in this bag but it is stuffed full. I’ll probably upgrade it next year for a larger pack but I do love this bag. I love tactical. Seriously, tactical gear is beautiful. It’s durable if you buy professional gear. But I was asked, over and over and over, “How many guns do you have in that bag” or “What are you, militia“? It was starting to get ridiculous. And truthfully, the Maxpedition set-up was less room than the old range bag and I knew it would be tough hiking it home in a SHTF situation with a sling bag. 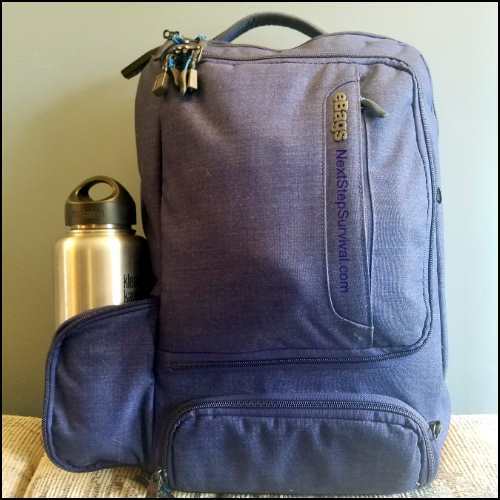 I felt a traditional backpack would be easier to carry a long distance, even though I generally carry my new eBags pack like it was a sling bag, using just one strap thrown over my shoulder. So with a blue eBags pack, I get more room, a more comfortable carry, and it is “gray-man” so no one gives it a second look. We live in a very judgmental world. 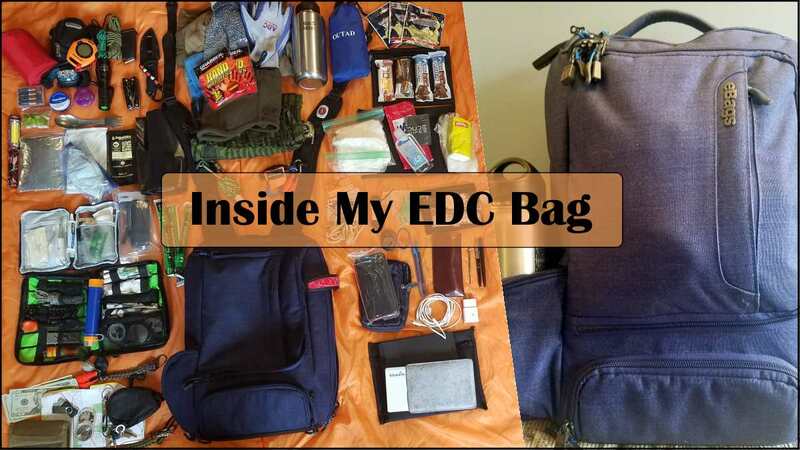 What Gear Do We Need In An EDC Bag? We all have different things we need day to day and, like I mentioned, that changes often. Gear will be determined by your situation, circumstance, and objective. For example, I live in a semi-rural area outside a small town in south-east Michigan. I work about 12 miles from home and I drive a truck locally. 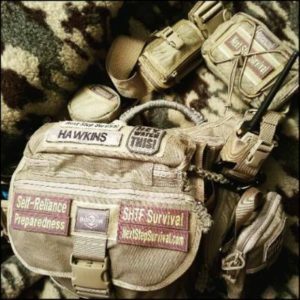 The objective for my EDC bag is to get through my day without the lack of essentials I may need as well as have the survival gear to make it home should the SHTF. On foot, if necessary. I’m on the road all day long, in environments ranging from gravel roads to mid-sized city streets. I have an increased risk of encountering severe auto accidents so I carry a trauma first aid kit. I live in a location where winters can become severe so I carry cold weather gear and clothing. I should be able to make it home in under 10 hours on foot but that is subject to weather, ground conditions, and the local situation. I have to take into consideration that I could end up spending a few hours hunkering down somewhere in route. For this reason, I carry minimal shelter and survival gear. But That’s Me, What EDC Do You Need? Perhaps you live in the city. Or work from home and rarely leave the house. Maybe you travel the country or world on business. You might have special medical needs. Someone living high in the mountains will require different gear than someone living in the desert or the plains. Some areas are very restrictive on which types of weapons are permitted. As you can see, it’s all subjective. Think about your environment, what needs you have, how far you might need to travel and under what conditions. Then supply yourself with the appropriate gear and the knowledge to use it. Then you might include things you generally use day to day, for your job as an example. 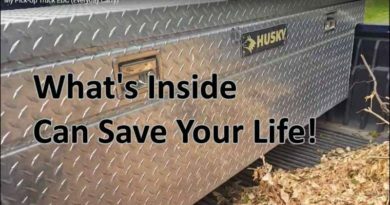 Determine how long you might be gone in the worst situation and base your EDC from that. Include any medications, shelter, food, water, protection, and other survival gear that is relevant to your particular needs. I wasn’t sure if I was going to take the time to list the items in the bag here but I was already getting requests for it a week before this post went live – thanks to social media. So here we go. Again, the bag is an eBags Professional Slim Laptop Backpack. I’m tired. I’m going to get some milk and cookies. My typical daily travel distance puts me about 75 miles from home in the Southwest desert. I wouldn’t (and don’t) carry fully half of the items that you’ve listed for a 12 mile hike. Why on earth do you need a 6′ tape measure, travel locks or Ranger beads to name only a few? You have made the point in a previous article that you’ve wasted a lot of money on items that you don’t need. My suggestion is that you go through your “EDC” bag and cull out some more useless stuff. Seriously. Thanks for reading Ben, like I said in the video, some people will think it’s too much and some too little. I’ve spent the last couple of years perfecting my EDC and I’m pretty happy with it right now. You might have missed where I said I use the measuring tape for work. I keep the lock on the zipper where my wallet goes. It won’t keep someone from taking the entire bag but it might keep someone from reaching in and grabbing my wallet. There are those rare times when I’m running late for work and set it on the picnic table while I get my assignments. The ranger beads weigh almost nothing and I made them myself as a project. I don’t need them to get home but it is something I practice with when hiking. Just like the knot tying, it’s just something to do. As far as my post on buying the wrong gear, I didn’t post that to insinuate I was broke because of it. We’re doing fairly well here. I shared that information to help others in case they were facing a similar situation. Tone it hard to convey in print so I don’t want to come across sounding arrogant or dismissive. I do appreciate you reading and taking the time to leave a comment. Even criticism is welcome and please feel free add your input anytime.